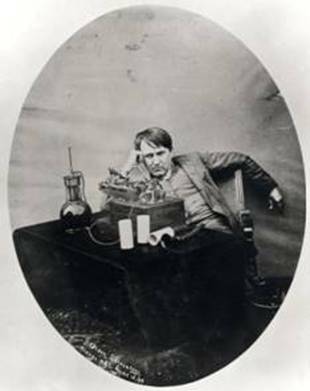 Thomas Edison memorabilia and antiques are always good sellers, whether in private transactions or bid situations like on eBay or other forums. Memories of the great inventor are highly collectible. Recently, at auction, a 1911 photo of Edison, bearing his handwritten note and signature, went for over $31,554. The photo had been estimated to have a $5,000 value, so passion for the man’s memorabilia had clearly dominated the bidding. This photo [below] shows Edison cradling his famous nickel-iron, alkaline storage battery; and bearing the note, “I believe time will prove that the Alkaline Storage Battery will produce important changes in our present transportation systems.” The signature at the bottom is known as the famous Edison umbrella signature. According to Associated Press who reported this story, the photo was the property of Walter Holland, who worked with Edison on the battery and published his lab reports on the project. Holland was appointed chief electrical engineer of the Edison Storage Battery Company in West Orange, N.J., in January 1911. The photo is dated May 4 of that year. At the time of this photo, Edison was involved with championing electric vehicles and their batteries as a clean alternative to gasoline powered cars, and of course the ubiquitous horse. 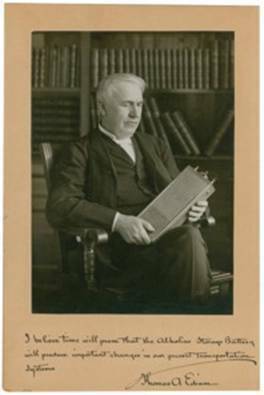 Work on this battery, which became one of the most versatile products ever produced by Edison, had been a long and tedious affair, with many failures, and requiring tens of thousands of experiments. His work on this technology is believed to have given birth to one of his famous quotes, “I have not failed 10,000 times, I’ve successfully found 10,000 ways that will not work.” His work on the battery system had begun in the 1890s. His rugged batteries also are a popular item that folks collect. These products were used in miner’s hats, lighting railway cars, railway signals, maritime buoys, by the ARMY and Navy and merchant marine and in other applications. It was a forerunner of the durable alkaline batteries we use today. At his West Orange site there was a huge building devoted to nothing but the manufacture of these batteries. In his garage at his nearby home, Glenmont, visitors can see the electric vehicles [and his famous batteries] he and his wife Mina used—as well as one of the first garage-based electric vehicle charging stations he had integrated into the building, exactly what we are talking about today for our garages, but accomplished by Edison in 1908. 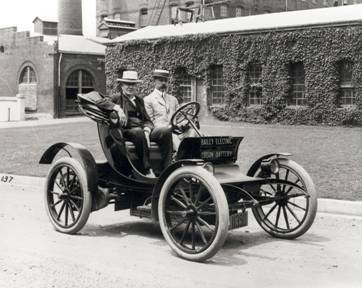 Here we sit 100 years later, promoting the use of electric and hybrid vehicles as a way to reduce our dependence upon foreign oil. Old Tom as usual was right on the money when he speculated back then that we would run out of oil. This technology also fit in nicely with his philosophy about using clean alternate forms of energy like solar and wind. You have got to love the vision of this man, an American original! This entry was posted in Did You Know? 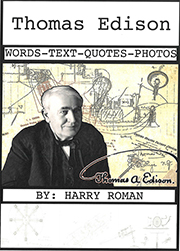 and tagged Edison History, Edison Muckers, Edison Only Links, Edison’s Valuable Memorabilia Celebrates His Vision, Inventor, Inventor Thomas Edison, science, Thomas Alva Edison, thomas edison, Thomas Edison History on January 4, 2012 by Edison Innovation Foundation. In today’s schools, the educational philosophy known as STEM [Science, Technology, Engineering and Math] has become popular and indispensable in integrating subject matter; and teaching young minds about the value of critical thinking and problem solving. 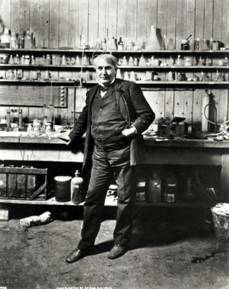 The roots for the modern day STEM philosophy actually date back to the late 1800s, when Thomas Edison was forging his invention factory / industrial R&D concept. It is plainly evident in the small cluster of buildings [which still stand today for public visitation] that formed the central focus of his legendary West Orange Labs. Here in his epicenter of creativity and invention, a one-acre nucleus of buildings formed the heart of Edison’s revolutionary enterprise….. an enterprise that would come to define today’s modern industrial model. An early photo of the Edison invention factory (ca.1888). These buildings remain to this day. Eventually an additional 20 acres of manufacturing buildings would surround this nucleus of buildings on three sides, employing 10,000 people in the making of a variety of Edison products. The small buildings arranged to the side of the main prototyping factory contained certain important specialties and expertise, and equipment that would be needed to support the multi-disciplined, multi-dimensional aspects of invention. There was a physics/electrical lab, a chemistry lab, a metallurgical shop, a model making shop; and supporting all this were engineers, scientists, mathematicians, inventors, technologists, machinists, draftsmen, and electricians. Edison knew back then that bringing ideas from concept to market required physical resources, and a multitude of talents and skills…..all conveniently available. He also had marketing, legal, accounting, economic, and sales expertise on-hand as well. Today’s modern business structure emerges from this integrated approach Edison formed for the solving of problems, and the launching of new products. 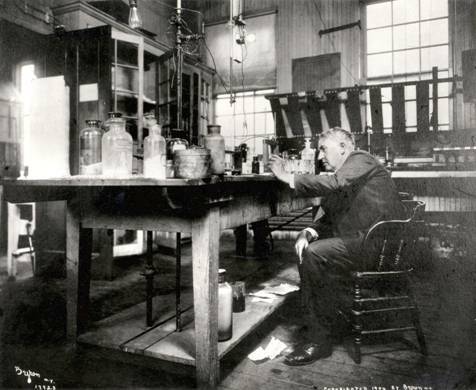 The world’s greatest companies today have R&D labs like Edison did, fully understanding how R&D project management crucially drives the process of new product commercialization. Edison becomes the first industrial project manager, forming interdisciplinary project teams, often overseeing as many as 30-40 teams at once. He is the premier integrated thinker of his time, matching people, talents, resources, and disciplines to solve multi-dimensional problems creatively. Teamwork was an essential part of the invention factory “magic”. Pulling “all-night”creativity sessions was not unusual at all. 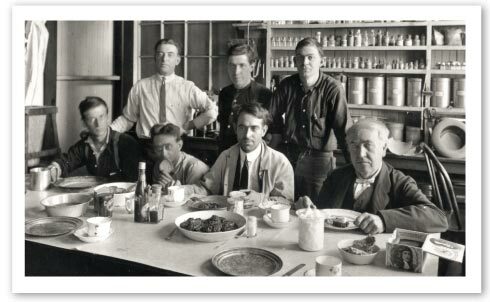 Here in a famous photo, Edison takes a meal with his famous “insomnia squad”. It is interesting to note how that initial two-acre parcel of buildings at West Orange produced enough new product ideas to keep the surrounding twenty acres of massive buildings around it busy turning out new products. 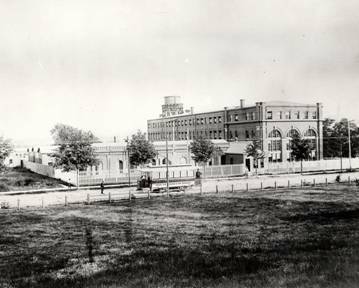 Those factory buildings are gone now, but at one time, the great inventor had 30 companies and 10,000 employees working under the imprimatur of Thomas A. Edison Industries. This is the iron core of strength that STEM thinking can produce in the real world. It has been shown to work for 125 years, forming the foundation for an on-going industrial revolution, and ultimately, today’s digital-electronic explosion. STEM is precisely what is needed in our schools to show the head and hands relevance of the school-to-work progression; and the application of knowledge to addressing world needs. 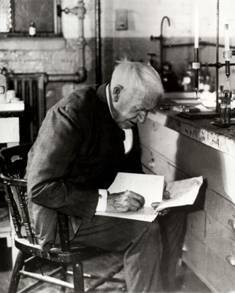 Throughout his life, Edison documented his work, staying true to his scientific process of invention. He so loved the process of research and development, he established his office in his library. The STEM of yesteryear has certainly evolved, and will continue to do so as mankind advances. 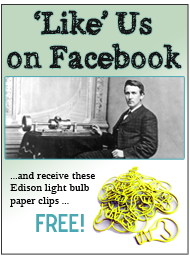 Back in Edison’s time, most folks were satisfied that new products were time-saving, understandable, and affordable. As our civilization progressed, we developed new concerns [design constraints] like environmental stewardship, product safety, and regulatory impacts that began to re-shape the way we saw the “Edisonian” model of progress; and this made new product development ever more complex, multi-dimensional, and inter-disciplinary….and all of this is good for a society’s growth….but make no mistake, STEM’s taproot lies at the heart of the legendary West Orange Labs, and the seminal idea of perpetuating the industrial revolution as a codified process….a process that revolutionized the cottage industry of invention into a commercial powerhouse. 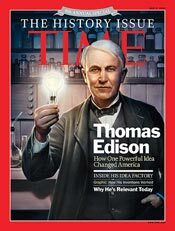 It is Edison’s greatest invention, and the heart of America’s ingenuity. West Orange is the “Mother Ship” of innovation. 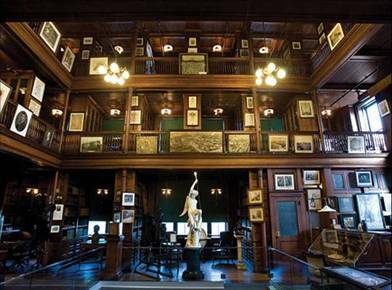 The famed Edison library-home to 10,000 technical books, journals and paraphernalia. Today, the total money spent on all national R&D in all sectors is about $370 billion (2010). That is bigger than the largest US oil companies, and also the entire electric utility industry, probably getting close to giants in revenue like Wal-Mart and the automakers. Obviously this style of STEM thinking has produced and continues to produce great success and wealth. When students study under the guidelines of STEM and technology education they are automatically invoking Edison-style thinking and problem solving, they are being readied for a world of global competitiveness, and adding great value to our society. 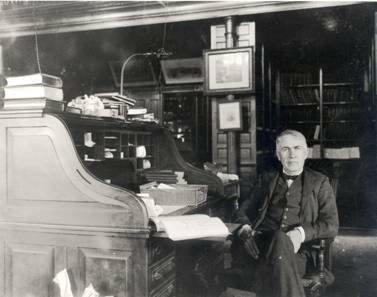 Edison at his roll-top desk, ready for work in his library-office. Technology education does in miniature, what must be done to the entire school curricula……integrate it…change the way we teach school [and teach teachers] to focus on subject integration and creative solutions to problems. Statistical relevance of IQ test scores is not the only metric we need to concentrate on anymore. It is how students solve problems, the thinking processes applied, that we need to address. It is the driver for the future. 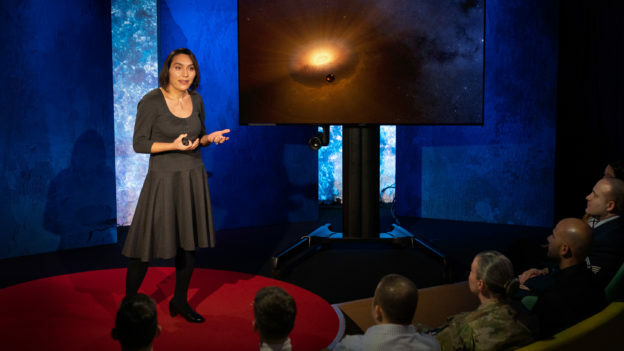 It will win the competitive wars, and get us back to that Edison spirit, of which President Obama spoke in 2011 in an important address to the nation. Technology education is the paradigm shift, whose roots are firmly grounded in a small cluster of buildings known as Thomas Edison’s invention factory/R&D lab. Every Fortune 500 company has an R&D lab. What does that say about how valuable STEM thinking is? The customers of technology education and STEM are not just the parents and educators. It is our entire society. 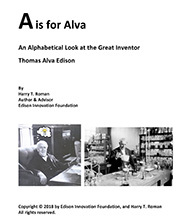 This entry was posted in STEM and tagged Edison and the Roots of STEM, Edison Muckers, edisonmuckers.orhg, Engineering, Math, science, STEM, technology, Thomas Alva Edison, thomas edison, Thomas Edison and STEM, Thomas Edison Muckers, thomasedison.org on October 5, 2011 by Edison Innovation Foundation.